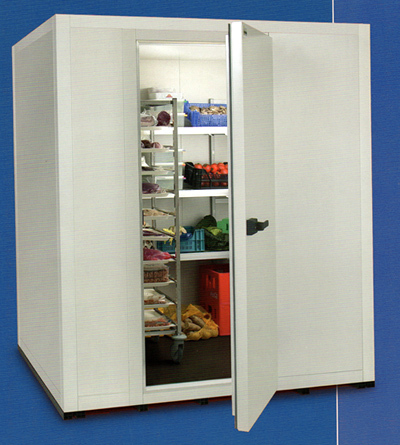 Small cold rooms are ideal for preserving food and perishable products. Restaurants, pharmacies, laboratories, hospitals, butcheries, bakeries and flower shops all use them extensively. They are also popular within the automotive industry such as for storage of the carbon fibre rolls used in the build of Formula 1 racing cars. The Ministore cold room (pictured right) is one of the best selling, quality, small cold rooms available on the market today. It is a cold room which has become popular for personal use and on commercial shoots for pheasant storage. 30 models available. Unidirectional swing door can be positioned in any wall. This premium small cold room is now available in 2400mm external height. A great new option for many business operations! Our Minibox cold rooms have been used in many new build projects including a special build project for Domino’s Pizza in the UK. Fast food outlets, restaurants, etc sometimes need a small cold room with a refrigeration unit. We can offer 2 types of Refrigeration Package System for this purpose: the Intarblock 11-1 saddle type unit or the split 13 system. Click here for more information on refrigeration units suitable for small cold rooms. If you are looking for large, commercial cold rooms we can also help. As leaders in the field of commercial cold room design and manufacture we have a portfolio of clients around the world. For more information please visit our commercial cold rooms page. You can also check out our page on shelving. One very important aspect of cold room management is that of protection against frost heave. It is something that every business using cold storage should consider. We can supply the solution with our frost heave mats. If you have a cold room requirement, large or small, standard or specialized, just contact us for more information and we will be pleased to quote for your requirements. 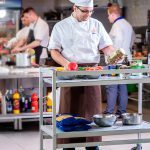 Our Technical Director Allen Strange has many years of experience in supplying and installing small cold rooms and he will take into consideration all aspects of your requirement including any refrigeration plant and heater mats.